I had a registration form in Apex which asks the applicant to enter their Date of Birth in a date item; I then needed to calculate how old they would be at the start of the event, which determines a number of rules, such as whether we need to obtain their parent’s permission. This worked fine – it takes advantage of Oracle’s builtin support for date arithmetic. However, it was rather slow, because it needs to do a roundtrip to the database to run the query and return the result. Add a Dynamic Action to the Date of Birth item which calls getAge() and sets the value of the Age display item. The result is a much quicker response and less load on the database. This is an intentionally simple example, you could do it in different ways to suit your situation (e.g. if you have multiple date items you need to handle on the same page, you might pass them as parameters to the function). What could be simpler than a set of “Next” and “Previous” buttons? I love Interactive Reports, they make it easy to deliver a lot of power to users for very little development effort. However, with that power comes some complexity for building certain features not available in the base Apex toolset. I had an IR with a fairly costly and complex query behind it, linked to another screen to view the details for a record. The users wanted to be able to view each record from the search result without having to click each record, go back to the Search, and click the next record, etc. Instead, they wanted “Next” and “Previous” buttons on the Single Record screen which would allow them to navigate the search results. 1. On the Single Record screen, run the query to determine what the next and previous records are in relation to the currently viewed record. 2. On the Search screen, instead of querying the tables/views directly, call a database procedure to store the query results in a collection; then, both the Search and the Single Record screens can query the collection. Some problems with solution #1 include (a) the query might be quite expensive, so the Single Record screen may be too slow; and (b) if the data changes, the user might get unexpected results (“that record didn’t appear in my search results?”). Another problem that both of these solutions share is that if the user has used any of the IR features such as custom filters, sort orders, etc. we won’t necessarily pick these up when determining what the Next/Previous records are. Certainly, the collection approach won’t pick these up at all. Instead, I’ve gone for a different approach. Firstly, I’ve simplified the problem by dictating that the Next/Previous buttons will only allow the user to navigate the list of records they most recently saw on the search screen; therefore, if the results are paginated, we’ll only navigate through that page of results. If the user wants to keep going, they’ll go back to the Search screen and bring up the next page of results. The solution is quite simple in concept but was a bit tricky to implement. The basic idea is that I encode the record IDs in the HTML generated by the report, and use some Dynamic Actions to grab the resulting list of record IDs, store them as a CSV in a page item, which can then be parsed by the View/Edit screen. 1. 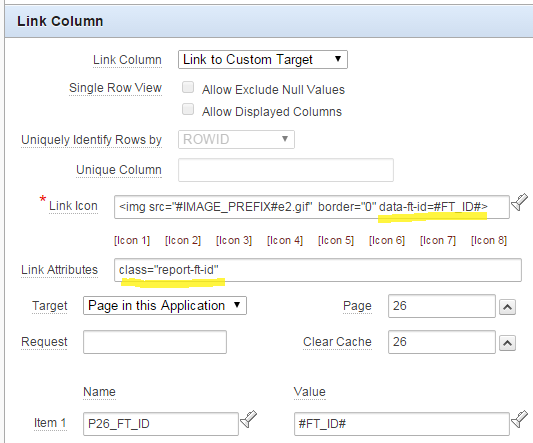 In the Link Column on the interactive report region, add class="report-ft-id" to the Link Attributes. 2. In the Link Icon, add data-ft-id=#FT_ID# into the img tag. I added this to the img bit because the Link Column field doesn’t do the #FT_ID# substitution, unfortunately. This function searches for any records shown on the page by searching for the report-ft-id class, extracts from each one the img node’s data-ft-id attribute, maps these into an array, and then squashes that array down to a comma-separated list. 4. Create a hidden item P23_FT_ID_LIST which will store the resulting list. 5. Create an application item FT_ID_LIST which will be read by the Single Record page. (b) Execute PL/SQL Code which runs the code :FT_ID_LIST := :P23_FT_ID_LIST;. Make sure to set Page Items to Submit to P23_FT_ID_LIST and set Page Items to Return to FT_ID_LIST. This dynamic action will only fire when the page is initially loaded. 7. Copy the Dynamic Action, but this time set the event to Custom and the Custom Event to apexafterrefresh. This way, whenever the user changes the rows shown in the report (e.g. by paginating, or changing filters or sort order, etc. ), the list will be refreshed as well. 9. Add two hidden items to the Single Record screen: P26_FT_ID_NEXT and P26_FT_ID_PREV. 10. On P26_FT_ID_NEXT, set Source Type to PL/SQL Expression, and set Source value or expression to next_id(:FT_ID_LIST,:P26_FT_ID), and similarly for P26_FT_ID_PREV to prev_id(:FT_ID_LIST,:P26_FT_ID). 11. Add buttons Next and Previous, with Action set to Redirect to Page in this Application, pointing back to the same page, but setting the P26_FT_ID to &P26_FT_ID_NEXT. and &P26_FT_ID_PREV., respectively. This method means that it doesn’t matter if the query behind the report changes, or if the user adds filters or uses different saved reports; the Single Record screen doesn’t need to know – it just needs to know what the list of IDs the user most recently saw on the Search screen were. Server load – the dynamic actions on the report refresh, which causes it to do an ajax call to the database on every refresh of the IR. But at least it saves the View/Edit screen re-executing the query on every page load. Rows Per Page limitation – since we save the list of IDs as a CSV in a single string variable, we may have issues if the user sets Rows Per Page to “All” with a large result set – so we need to limit the Maximum Rows Per Page to about 3,000 (this assumes that all the IDs will be less than 10 digits long) to fit in the 32,767 char limit. YMMV. Duplicate records – this method assumes that the IDs shown in the report will always be distinct. If this is not true, the next/previous functions will not allow the user to navigate through the whole list. My application normally responds to button clicks with sub-second performance, but there were a few operations where users can initiate quite long-running transactions (e.g. up to 15 seconds long in one case where it was hitting an eBus interface thousands of times). When the user clicks the button, I want the page to show a “Please Wait” message with an animated running indicator (I won’t call it a “progress bar” even though it looks like one, because it doesn’t really show progress, it just rotates forever) until the page request returns. To do this I added the following to my application, based largely on this helpful article. If I omit the second parameter, the function skips the confirm popup and submits straight away. Known Issue: the animated gif doesn’t seem to animate in IE8. So far I haven’t worked out how to solve this, except to burn IE8 with fire and extreme prejudice. I’ve tried using setTimeout to delay showing the div but it stubbornly stays frozen. I have a Tabular Report with an editable Amount item. When the page loads, the total amount should be shown below the report; and if the user updates any amount on any row, the total amount should be updated automatically. Note: this method does not work if you have a tabular report that might have a very large number of records (as it relies on all records being rendered in the page at one time). 1. Make sure the report always shows all the records. To do this, set the Number of Rows and the Maximum Row Count to a large number (e.g. 1000). 2. Add an item to show the total, e.g. P1_TOTAL_AMOUNT. I use a Number field, and add “disabled=true” to the HTML Form Element Attributes so that the user won’t change it. 3. 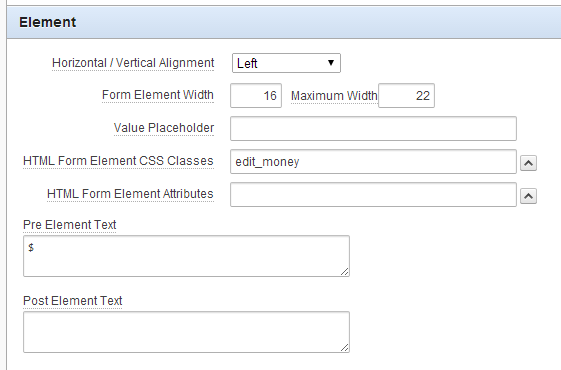 Examine the generated HTML to see what ID is given to the amount fields in the tabular report. In my case, the amount field is rendered with input items with name “f04” and id “f04_0001”, “f04_0002”, etc. This strips out any commas from the amounts before parsing them as Floats and adding them to a running total; it finally formats the total using my formatMoney function and updates the total amount item. To prime the total amount field when the page is loaded, I have a Before Header process that calculates the total based on a simple query on the table. Now, in my case I want to have two running totals: one for “Cash” lines and another for “Salary” lines. My tabular report renders a radio button on each record which the user can select “Cash” or “Salary”. So instead of just the one total amount field, I have two: P1_TOTAL_CASH and P1_TOTAL_SALARY. The radio buttons have hidden input items with the value, rendered with id “f05_nnnn” (where nnnn is the row number). 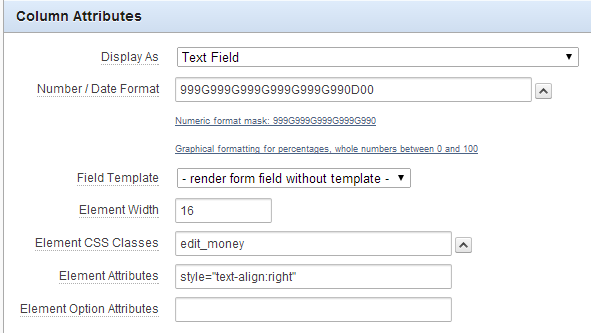 Now, when the user changes the amounts or changes the line type, the totals are updated dynamically. I have a standard tabular report with checkboxes on each row, and a multi-record delete button called MULTI_ROW_DELETE. If the user clicks the button before selecting any records (or if there are no records), they get an error message. Instead, I’d rather hide the button and only show it when they have selected one or more records. 1. Edit the MULTI_ROW_DELETE button to have a Static ID (e.g. “MULTI_ROW_DELETE”). This looks to see if there are any checkboxes selected, if none are found it hides the delete button, otherwise it shows it. This does the initial check on form load (i.e. it initially hides the button, since none of the checkboxes will be selected yet), and adds a listener to the checkboxes so that if any of them are changed, the function is re-run to show or hide the button as needed. Unfortunately this doesn’t work with the “all rows” checkbox that was generated by the tabular report, so I’ve added a step to hide that checkbox (“check-all-rows”) until I can find a solution for that.